Short back and sides and don’t forget to pay the fine! Goodbye Bill, thanks for your custom and your years of stellar service to the country. It was a while back now but a truly memorable day for us - parking in Johnston Street will NEVER be the same! We're fairly sure parking the tractor in Dipton will be a lot easier but it still might make it to the newspaper! If you come back to Wellington at any stage we hope you'll elect to join us again sometime for a haircut. We give Prime service! The team at Haight ashbury wish you well, all the best with your new endeavours. After years with us, we are sad to see our lovely Poloa Rowe off on her next adventure. We will all miss her and wish her the very best. However as one leaves, we are extremely excited about the return of our favourite new mum! That's right everyone, Jenna Herrick is about to return to us from maternity leave! Jenna is starting back in March, beginning with 2 days a week. To everyone who has missed her as much as we have, get in quickly as her days will fill up fast. Looking around you now, so many celebrities are sporting short hair! Despite this, people are reluctant or afraid to jump on board and have the chop. Short styles are back in vogue - embrace it, trust it, and let your "Hairdresser" be the CREATIVE STYLIST they were trained to be. At Haight ashbury the skills of our team are second to none. After 15 years of “just a trim” and tying your hair up because it's easy, it's time to let your Stylist off the leash! Be BOLD! Spice it up! Join the Revolution! Here comes the “Silly” Season! For a lot of people, December and even November brings a series of frantic last minute things in their lives. Worrying about your appearance shouldn't be one of them! Steal the show at your work-dos with a fast, affordable style at Haight Ashbury from our Express Menu. Introduced at the beginning of the year, our Express Menu will have you out the door in 30-45 minutes feeling relaxed, confident and fabulous with a “Rocking” style. Ranging from $35-$45, you don't need to break the bank to look great this Christmas. Just pick one of our gorgeous looks and leave the rest to us. Book today and take the stress away with Haight Ashbury's Express Menu! Express Keratin Blow-Outs - Bring back the Shine! Do You have thick, frizzy hair? Are you lacking shine? Are you feeling limited in style options for any of these reasons? Gone are the days of limitations! Haight Ashbury has just the thing for you - it's simple, quick and easy with an Express Keratin Blow-Out! Easy to add to most salon services, and recommended 3-4 times a YEAR, why resort to tying your hair up on a daily basis because it is unmanageable or uncontrollable? Why be afraid of the rain? Matched with the right home care, you will be unstoppable! Book with Jani today for a $30 consultation (deducted from the service once completed) and change your life at Haight Ashbury! 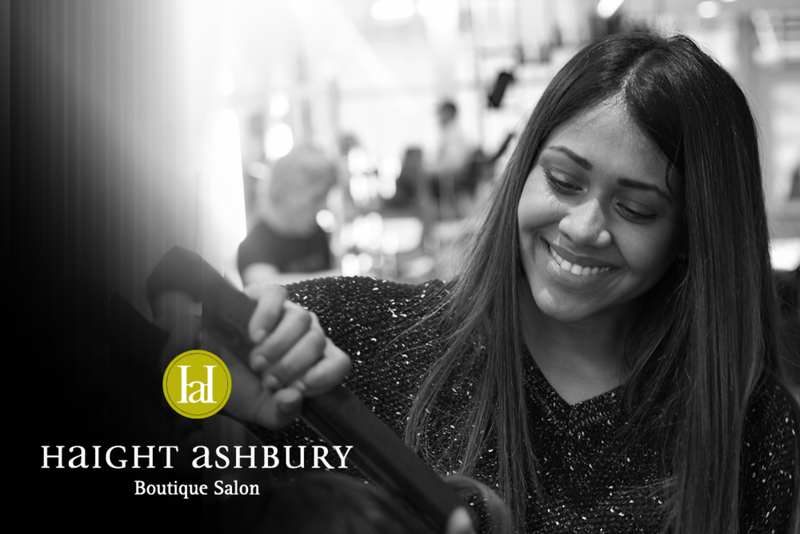 Haight ashbury are pleased to welcome our new stylist Jannike D'Sa to the team. She brings with her a wealth of knowledge about the hairdressing industry. Jannike is expert in the technique of balayage and freehand colour work, loves blow-drying beautiful styles and is great at taming thick unruly hair. Come and talk to Jannike for tips and tricks on how to achieve fresh, salon finished looks and have a good hair day, every day. Book with Jannike till the end of August and receive a complimentary Kerastase Fusio-Dose treatment with your next cut or colour. We are proud to announce our very own Andy Alsop was selected as a Hans de Fuko Men's Stylist Finalist for the 2017 Industry NZ Hairdressing Awards. Andy would like to give a big shoutout to alex.efimoff (photography), @derekelvy (styling), his team of models @elliottbentonhairdressing, @mrtemoananui and @franklewisapparel for killing it behind the lens, and the group as a whole for makeup. A special thank you to Rob and the #Haightashbury team for the continued support and encouragement. We are excited to release a new look for the Haight Ashbury website. L'Oréal new smart bond treatment, a must do with all colour work. New Kerastase hair spa launch. Jason Muir, Anne Mackris-Berdebes, Sonya Rostedt, Jani Hashim, Sheldon Ming-Wong, Jenna Herrick and Poloa Rowe. They are the backbone of our business and the success of Haight ashbury can be attributed to their longevity and skill. Long may it continue.